A quintessential form, pared down to its most elegant components, Wit is a collection of companion piece tables to Arper’s seating catalog. Compact in form, but expansive in use, Wit can act alone, or pair in groups for commercial or contract contexts while still retaining its archetypal identity. 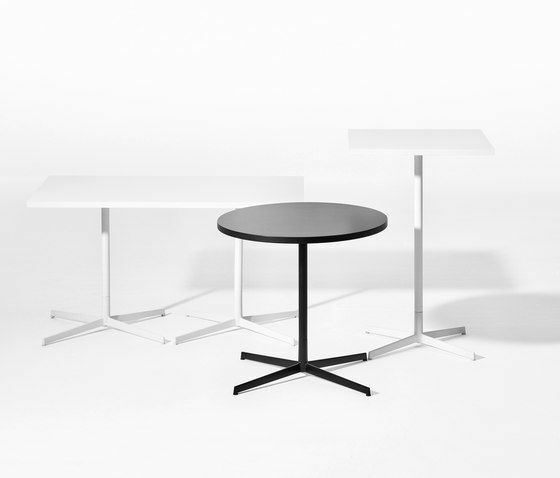 Wit joins Arper as a collection of tables designed to complete the sentence of Arper’s seating options. Durable materials like aluminum, high-pressure laminate and wood create a sturdy construction of an adaptable form available in round (started from Ø 60 cm), square (started from 60 X 60 cm), or rectangular (started from 70X140 cm). An aluminum cross base supports the integrity of the silhouette to create a form that can be repeated for group contexts like restaurants or bars, or isolated for use at home where a union of function and beauty are paramount.